Maxim-Filimonov is a social entrepreneur with over 10 years of experience in the software development industry. He holds a master’s degree in computer science from the Bauman Moscow State Technical University. If he’s not glaring at lines of code, he likes jumping up and down in the sweet tune of the Ukulele dance and spending time on the beach. Maxim-Filimonov will be tackling this project: How to Build Cross-platform Mobile App in React Native. This project is in TEACHING mode. Furthermore, it’s delivered live and interactively. You will see the project creator building a cross-platform mobile app in real-time. If you have any issues, you can always communicate directly with him. Forget about building two separate apps for iOS and Android mobile devices. React Native allows you to build an app once and deploy it on both iOS and Android operating systems. Is this awesome? This project is about building world-class, cross-platform apps using the Facebook-powered React Native technology. 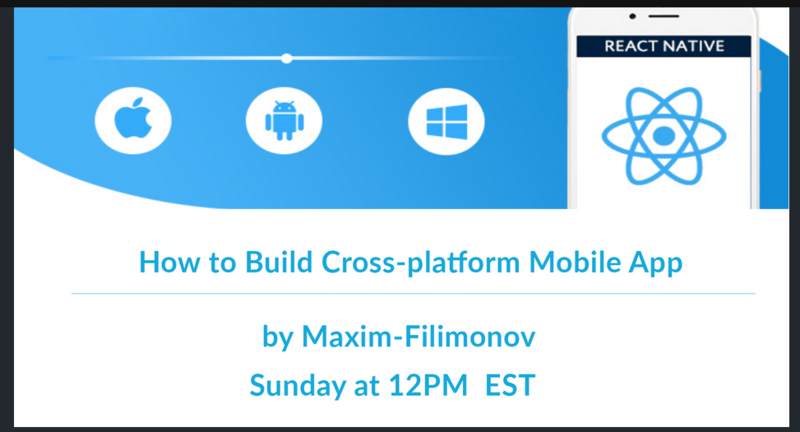 Maxim-Filimonov will take you through the entire process of creating a complete and operational mobile app without using Swift, Objective-C, or Java. He will teach you every step and concept in using React Native—from the basic processes of setting up the right development environment to the more advanced topics of ensuring your app runs well. FOR WHO IS THE PROJECT AIMED AT? If you want to learn to build a cross-platform mobile app without depending on the complicated Swift, Objective-C, or Java technologies, then this project is the right one for you. Furthermore, if you want to enhance your knowledge of React Native, then you’ll find this project very instrumental. Importantly, if you have a desire to learn, this is the project you need to expose you to the capabilities of React Native in building cross-platform applications. WHAT WILL YOU BE ABLE TO DO AFTER FINISHING THE PROJECT? After completing the entire six sessions of this project, you’ll be able to develop an amazing cross-platform mobile app without any difficulties. With the increasing popularity of React Native, this project will equip you with the right skills to become efficient at building cross-platform applications. Additionally, the concepts you’ll learn from this project can assist you to improve your skills as a developer. You will learn how to set up the development environment for React Native quickly and effortlessly. You will learn how to create the internal code structure of the mobile application without including the user interface. You will learn how to include Redux for maintaining the state of the mobile application. Redux assists in managing complicated state interactions that are difficult to convey with React’s component state. You will learn how to add a beautiful user interface to take care of the various user actions. This session digs deeper into adding user interface to the mobile application. For example, you will learn how to use async storage for storing data on mobile platforms. You will learn how to deploy the mobile application on both iOS and Android platforms. In fact, since it’s capable of supporting the building of cross-platform apps, developers using React Native have noticed more than 30% reduction in mobile app development costs. To start learning this wonderful technology, you’ll need a LiveEdu.tv Pro account. The Pro account is affordable; it starts at only $9.99 month, which is less than $0.32 cents per day. Furthermore, if you subscribe to this project, you’ll also get access to other comprehensive projects.